This a chart for Abraham Lincoln, probably the most-celebrated President in United States history. Americans, especially liberals, love Lincoln for ostensibly ending slavery in America and for representing the ideals of a modern, free, democratic society. 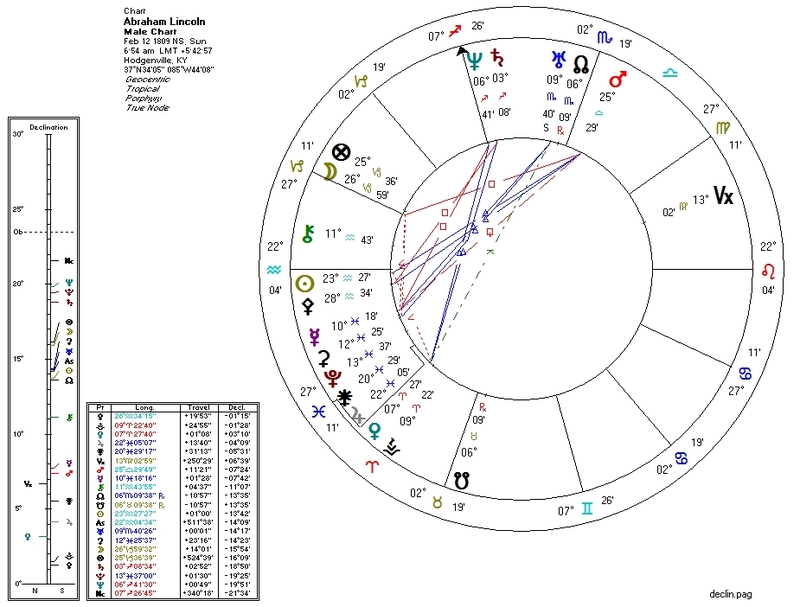 Being that we know that a person's political ideology and ethical structure are apparent on the astrological chart, it would seem that Lincoln's chart should shine brightly with the light of the astrological Pallas Athena. Indeed, Lincoln's chart sport a prominent Sun-Pallas conjunction on the Ascendant. Pallas is also widely conjunct Mercury by 12 degrees, and the Sun is parallel with the expansive North Node. This bodes very well, but we would be remiss if we stopped here. Some disquieting factors draw our attention. Pallas and the Sun are in Aquarius, ruled by both Saturn and Uranus. Uranus is conjunct the North Node -- good for Pallas, but US Presidents with this conjunction have had a tendency to kill extremely large numbers of persons (think Obama, Bush II, and Clinton). Saturn, the other co-ruler, is quincunx the energy-draining South Node. Uranus is trine Pluto and Saturn is square and parallel Pluto. On top of all of this, the Sun is also quintile the South Node. What appears to be at first a highly libertarian chart turns out to be quite authoritarian-leaning. The Neptune-Venus trine suggests a leaning towards something other than capitalist economics. The North Node trine Mercury, ruler of the Fourth House, suggests a cultural conservatism -- but this type of aspect combined with a debilitated Pallas often comes with deep racism. Can this be right for the chart of a Great Emancipator? In fact, the entire chart picture is not that of a great champion of freedom, but is more typical of a modern Neoconservative, a 20th century Fascist, or an early American Progressive: authoritarian, racist, and economically controlling. On top of this, Pluto's aspects to the co-rulers of the Sun, conjunction with Mercury (Fourth House ruler), and sesquiquadrate with Mars, ruler of Venus, completes the Bloodbath Formula. This is the chart of not only a horrible political personality but a potential killer. Either my astrology is wrong, the birth data is wrong, or the mainstream history of Lincoln is wrong.